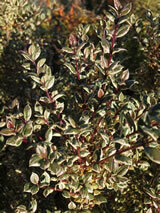 Lovely evergreen shrub with cinnamon coloured bark which peels off exposing a beautiful cream-coloured inner surface. Oval dark green leaves margined with creamy yellow, pink tinged when young. White flowers in summer and early Autumn. These are followed by sweet red and black fruits. Lovely as a small speciemen tree or for hedging. Hardy, though avoid very dry sites.